Info JONES, Woodrow Wilson, a Representative from North Carolina; born in Green Hill Township, Rutherford County, N.C., January 26, 1914; attended the public schools of Rutherford County, N.C.; graduated from Mars Hill College, Mars Hill, N.C., 1934; graduated from Wake Forest Law School, Winston-Salem, N.C., 1937; admitted to the bar in 1937; lawyer, private practice; United States Navy, World War II, 1943-1946. Delegate to all Democratic State Conventions, 1940-1960 and delegate to Democratic National Convention in 1960; chairman of North Carolina Democratic Executive Committee, 1958-1960; appointed by Gov. 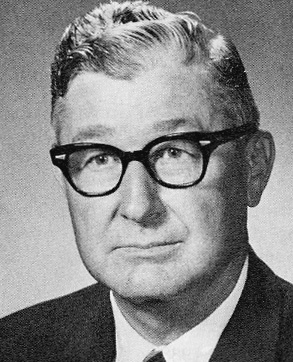 Luther Hodges as a member of state constitution commission, 1958-1960; appointed by President Lyndon B. Johnson as district judge of the United States Courts for the Western District of North Carolina and served as senior district judge, 1968-1985; died on November 25, 2002, in Rutherfordton, N.C.; interment in Rutherfordton City Cemetery, Rutherfordton, N.C.